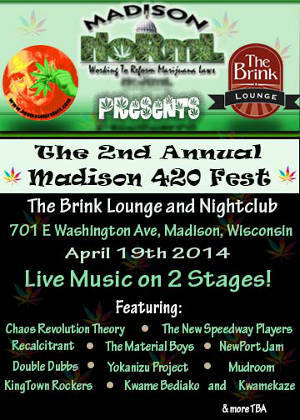 Cannabis fans here in Madison will be able to ring in the holiday in style this year at the 4/20 Festival at The Brink Lounge. This event will benefit Madison NORML as well as The Ben Masel Project. The celebration is hoping to promote marijuana awareness and will also feature two stages of live music from nine Madison and Midwestern bands. The 2nd annual Festival will also have vending booths as well as non-profit tables for more information on marijuana reform. The Ben Masel Project is a study being conducted in the state of Wisconsin to help medical marijuana applicants to attain a medical card. The objective of the study is to determine the number of qualified medical patients who would be willing to attain a medical card as well as determine exactly how much revenue the state is losing that could be generated from the legislation of marijuana in Wisconsin. Ben Masel was a long time supporter of marijuana reform laws in Wisconsin and passed away in April 2011 Respectfully, the Madison City Council has since declared April 20th “Ben Masel Day” to honor and remember his dedication and influence on the city. Riedasch was a key person in getting the festival off the ground last year when no one else was up for the task. He, along with Aaron Konkol from Natty Nation, and Joe Burbach from the New Speedway Players began brainstorming and felt they should do something to both raise awareness for marijuana reform laws, create an event of remembrance for Masel, as well as a celebration of cannabis. Riedasch, who has also been on the Madison NORML board of directors for the past eight years, also took over duties for organizing and booking for the annual Great Midwest Marijuana Harvest Festival in 2004. The festival takes place in October in Madison. “In 2013 I teamed up with Aaron from Natty Nation and Joe from New Speedway Players and we created the Madison 420 Festival to continue the celebration of Ben Masel and everything else cannabis on such a fitting day. It was a hugely successful and we raised over $1000 for the Ben Masel Project and Madison NORML,” says Riedasch. While parts of the the United States have seen huge leaps in terms of marijuana legislation, Wisconsin is somewhat behind on the trend. However, Riedasch does see progression towards legalization here in Wisconsin. It just might not be quite as soon as some would like. He states that the struggle has not deterred members of NORML, just put things into a bit of perspective. Riedasch urges people around the state to take action and become excited over the movement. He believes that a little work, and teaching of the good, both medically and financially that can come from the crop, can go a long way.